It has been 1 year since we started this blog when there were only 2 readers (CZM read my post while I read hers) to thousands of readers now. Interestingly, the first post of the blog was actually written by CZM - Food in London on 29/12/2016. 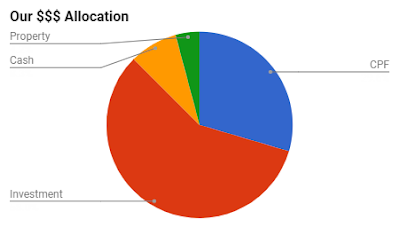 Majority of the readers are from Singapore. Majority of the readers are between 25-34. Personally, I thought this graph is really interesting. Between 18-24, people have yet to start working hence, there is no need/reason to read up on finance/investment related stuff. 25-34 is when people enter the real world - start working, have some money but do not know what to do with them. 35-44 is when people have worked for at least 10 years, managing finances/investment is lesser of a problem. Precious time are mostly spent with family/children, reading bedtime stories instead of blog posts. The people in the 45-54 group would be thinking this 27 years old couple have not even live through a financial crisis. Better stop blogging. The 55-64 group can tell us that he/she is twice our age. Half will disagree on my CPF related articles while the other half will say good job. 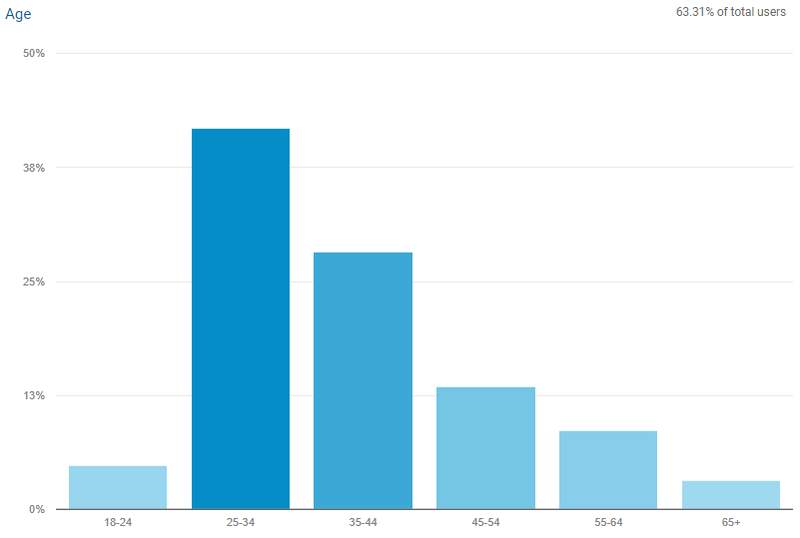 I am pretty amazed that 65 and beyond still drop by our blog. 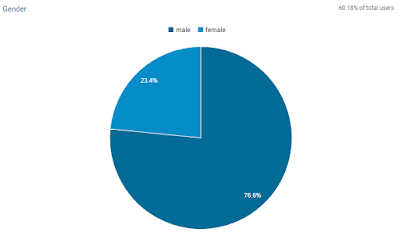 More than 75% of the readers are male. 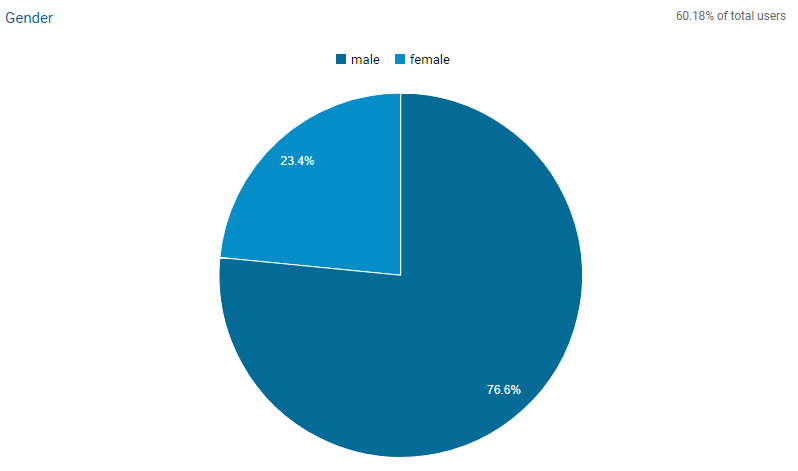 So disappointing, I thought I would have more female fans. 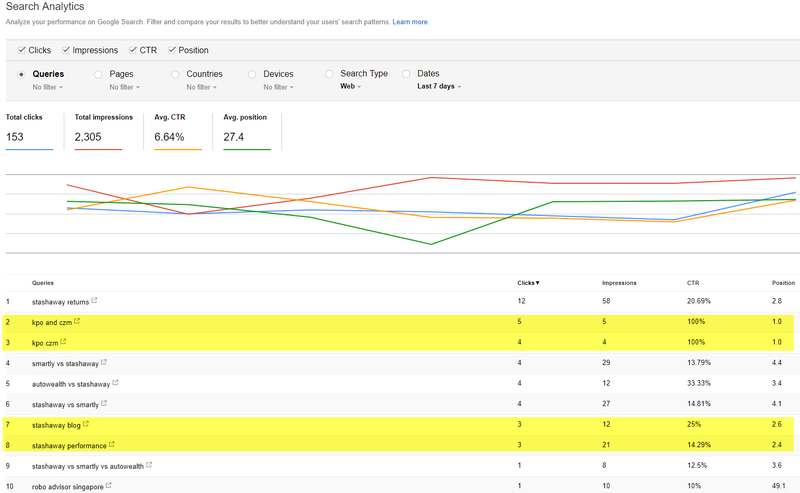 There are many other numbers and graphs in google analytics but they do not make much sense to me. 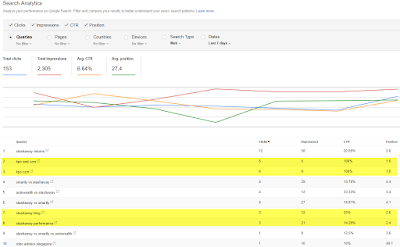 Based on the last 7 days of data, the easiest way to find our blog on Google is by searching for "kpo and czm" or "kpo czm" where the blog is indexed at the number 1 position! A search on "kpo" will bring you to the bar instead. Interestingly, our blog is ranked pretty high up for a search on "stashaway blog", "stashaway performance" or "stashaway returns". Let me start by wishing everyone Merry Christmas!!! 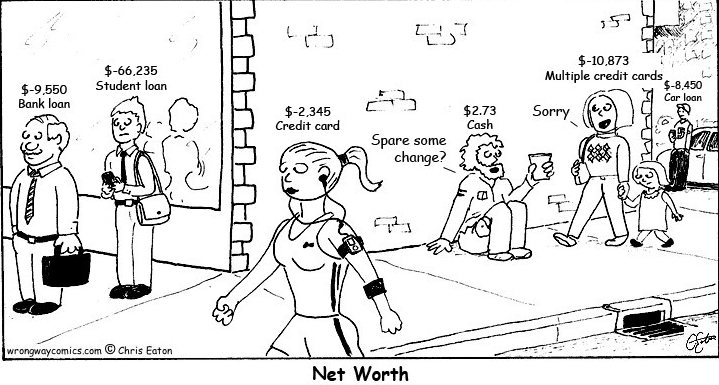 Net worth is easily one of the most important financial numbers one should know. It is like your personal balance sheet. 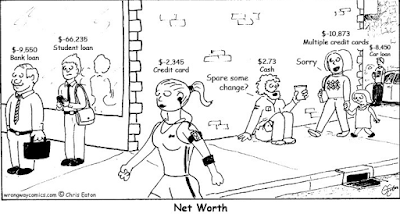 This is the classic comic where everyone is actually poorer than the beggar who has a net asset of $2.73. Your friend/colleague may be living in a huge condominium, driving some fancy car but it could all be financed by debts. There is absolutely nothing wrong with that as long as their income allows so. You can refer to the following articles/google on the importance of net worth. Every month, I will try to show CZM her net worth in order to motivate her to work harder towards financial freedom. However, she would always say I inflate her net worth because I included CPF. lol. I am sure some of you may have the same mentality but like I always tell her, whatever that is in CPF is our money and its main purpose is for retirement, not housing. 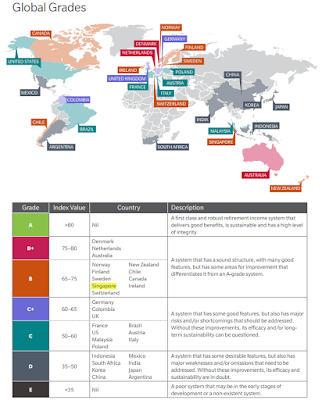 Singapore has one of the best pension/retirement system in the "world" (ranked number 7 out of 30 countries and number 1 in Asia) according to the 2017 Melbourne Mercer Global Pension Index. 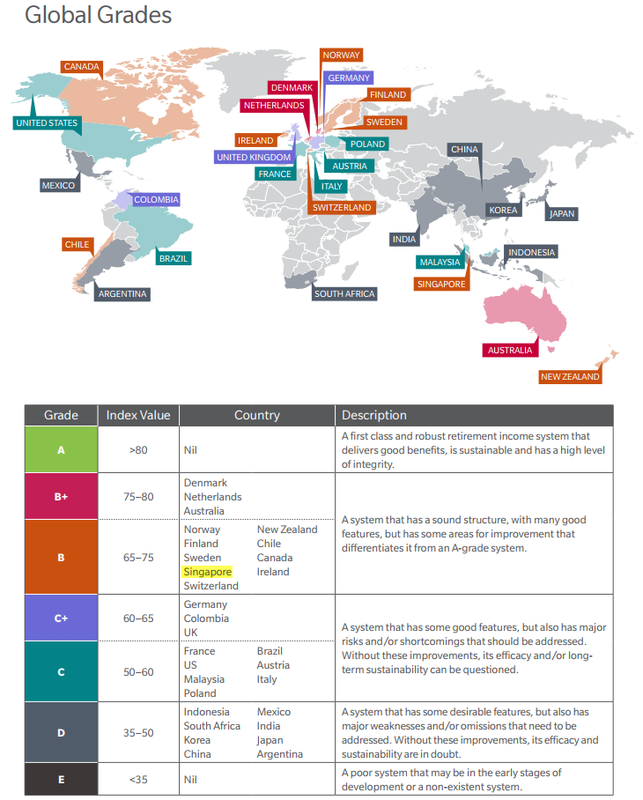 I find it extremely amusing when my colleagues from other parts of the world are envious of our retirement system while the locals are complaining so much about it. One of the biggest complain I always hear is the need to repay the "lost" interest when one sells the house but I shall not digress further. lol. I blogged about our portfolio last week. You can read in detail here - Portfolio Performance in 2017. We have achieved pretty decent return this year (XIRR of 14.85%) and across all years (XIRR of 9.60%). We have also invested some money through StashAway and the time-weighted return has been decent at 3.5% (SGD) and 5.3% (USD) till date. USD is giving higher return because there is some FX loss when converting the investment back to SGD. I believe that property should be included in the computation of net worth. If one excludes the value of the property, the money (cash/CPF) you use to pay for the loan/mortgage will be no different as disappearing into the thin air or throwing it into the sea. However, I would be conservative by valuing the property at cost/purchase price. We have only paid the first 5% downpayment so far and yet to start paying for the housing loan (still building). So I will just assume that the remaining $402,420 will be financed by the housing loan/mortgage. That would mean the value of our property is purchase price ($423,600) - loan ($402,420) = $21,180. If you are wondering, it is a 4 room HDB at a matured estate. What is the probability of us being your future neighbour? lol. Here you go! Our net worth pie chart, it looks pretty yummy to me :) CZM was asking if it is possible to hit $1 million by age 30... Shall try to estimate and forecast it another day. Are you tracking your net worth? 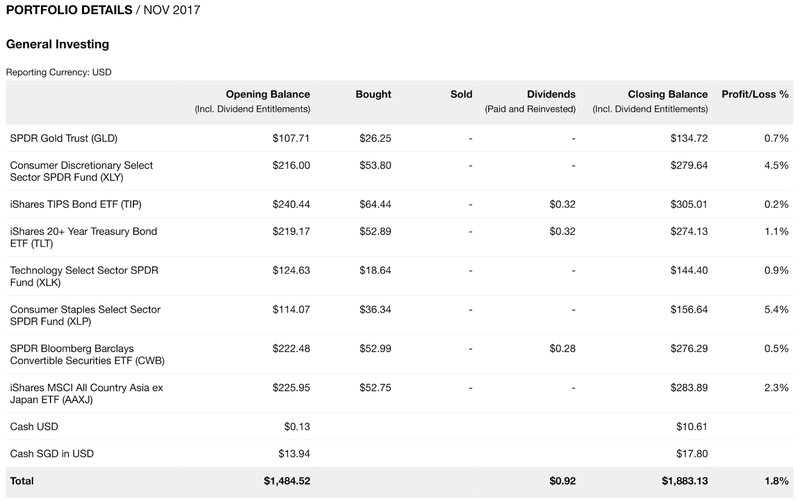 I believe we will not be buying/selling any more stocks as the year ends so let's take a look at how our portfolio did for the year of 2017. 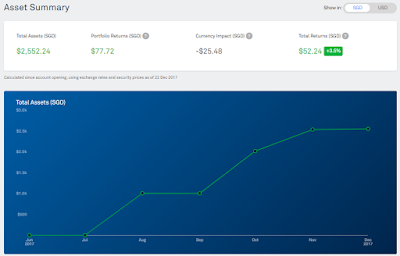 The overall performance of our portfolio since 2014 is 8.98% (time-weighted return) and 9.60% (XIRR). Yay! We are easily contented, our return is positive and higher than bank/CPF SA interest :) If you are wondering what is the difference between time-weighted return and XIRR, do read this article by common fund. In short, XIRR takes cash flows into account while time-weighted return does not so the way they are calculated is different. From the graph, you can tell that we have been consistently underperforming the market (benchmark against STI ETF) so do not follow what we buy/sell for better performance. lol. On a more serious note, I blame it on the first year when I started investing trading/speculating on penny stocks without any financial knowledge and broke Warren Buffett rule number 1 - Never lose money. These are our time-weighted return, monthly volatility and max downdrawn benchmarked against STI ETF over the years. 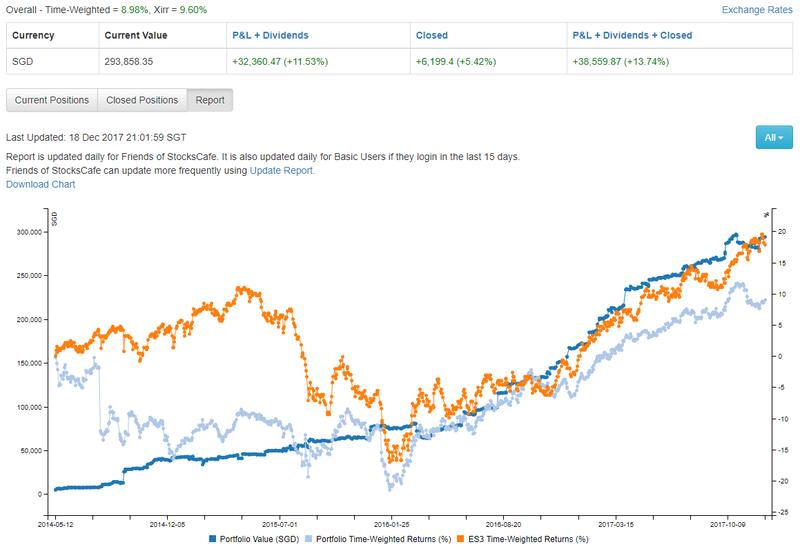 The year of 2014 was ridiculous -14.17% vs STI ETF 5.69%, can you imagine how much of catch up has to be done? 2015 was the turnaround year where I started reading and learning from books and blogs after paying some expensive tuition fee. We went on to beat the market return for the year of 2015 and 2016! Unfortunately, we could not get a turkey. The time-weighted return for 2017 is 16.02% vs STI ETF 21.46%! The monthly volatility is pretty close to STI ETF and the lower the better. As our portfolio grows bigger and we grow older, the same percentage represents a larger amount of money. Volatility is not good for the heart. Not too sure how to interpret the max downdrawn but you can refer to this article by Investopedia. The XIRR for 2017 is 14.85% with a capital flow of $94,428.15! Capital flow is the amount of capital that is being injected or withdrawn from your portfolio where the dividends collected are considered as capital withdrawn. We would usually redeploy the dividends collected back into the market hence the actual capital injection is around $84,000. If you are thinking we can do this because we earn big bucks and get demoralized. Please do not! I would like to say we are just extremely thrifty and without any debts. Our rate of saving/investing is at 70-90% of our salary for this year. Both of us are still staying with our parents and they are still feeding us. lol. How much can an accountant (4 years experience) and an IT guy (2 years experience) earn? There is a reason why I am called Kiam Pok Ong (KPO) which meant stingy in hokkien, not K-PO/kaypoh (busybody) which I suspect some readers think that way. 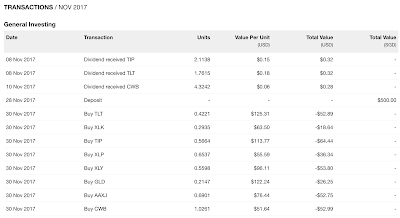 Our portfolio gave us a total dividend of $10,950.63 at an average yield of 4.47%. That is $912.55 passive income per month! 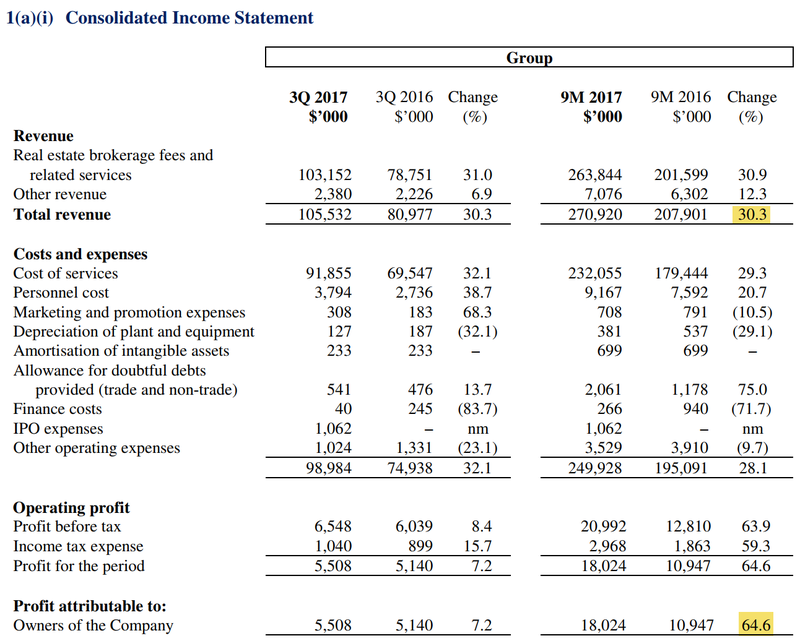 The dividends received in 2016 is very high due to the privatization of Saizen REIT (payout in the form of dividend before delisting this year) and a capital distribution by TSH. Unfortunately, the yield of 4.47% is below our target/expectation of 5% and there was a bump by both Saizen and Croesus Retail Trust this year. Stocks.cafe is even smart enough to project the dividends we will be getting for next year assuming everything remains constant. Seems like it is still at a low 4%, probably need to go back and hunt for REITs. Let's hope 2018 will be a great and better year for everyone and your investment! This is not a sponsored post but if anyone of you is investing and not tracking them, you should! If not you will never know how you are doing or learn from your mistake. 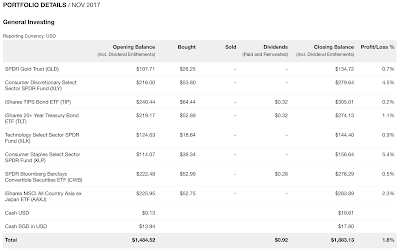 I will highly recommend you to use/try stocks.cafe which is an intelligent portfolio manager with stocks data for Singapore, Malaysia, Hong Kong and the United States + many reporting features such as what I have shared above. 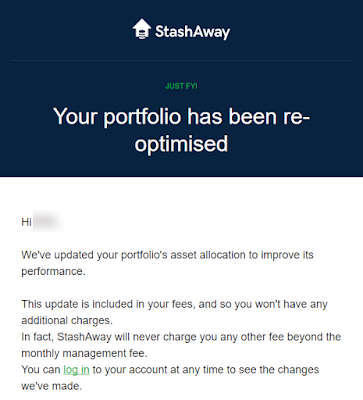 I received an email from StashAway last Friday (15th December 2017) titled "Your portfolio has been re-optimised". 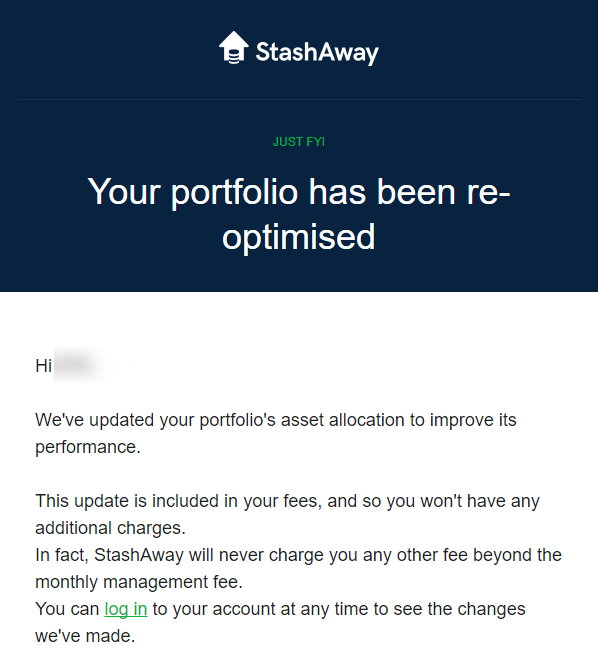 If you use StashAway and missed the email, you might want to click on this link to see what has been reoptimised in your portfolio. Let's take a look at what has changed for ours (General Investing - Highest Risk Level at 28)! Do note that the changes in allocations will vary across portfolios due to risk preferences. As stated, the main objective of this reoptimisation is to "harness the undervaluations of gold (GLD) and consumer staples (XLP)". 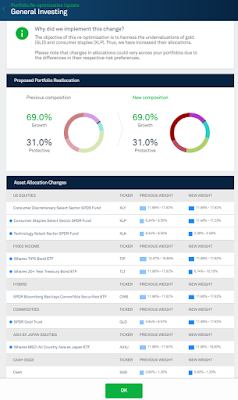 There are 6 changes in our portfolio as highlighted by the tiny blue dot on the left, next to the respective ETF. We can see that both the gold ETF (GLD) and consumer staples (XLP) have been increased significantly while the other 4 ETFs - technology (XLK), TIPS bond (TIP), 20+ year treasury bond (TLT) and MSCI all country Asia excluding Japan (AAXJ) have been reduced. Do note that once you acknowledge/click "OK", you will not be able to access this information again. So the next question is why? In fact, StashAway has given a heads up 3 days before (12th December 2017) the reoptimisation. The information can be found in the email titled "Monthly Market Insights from StashAway's CIO" by Freddy Lim and the article is published on their website/blog as well. I will highly recommend you to read his monthly update as it gives a quick update on what's happening to the current economy/market and how it would affect our StashAway portfolio. 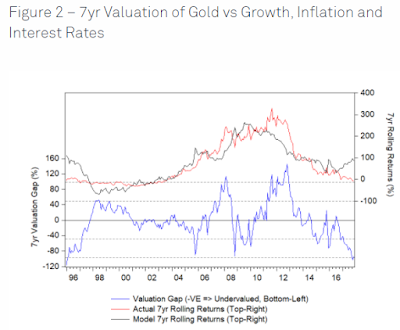 In summary, there is a valuation gap between the asset (gold and consumer staples) vs the economic fundamentals based on their complicated modeling. Do read the article for more information! 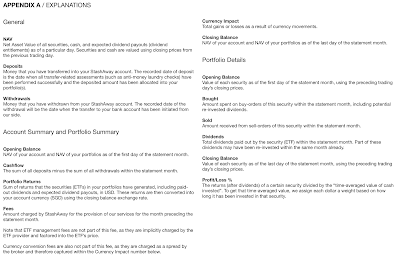 This is something which I like, the ability to reoptimise our portfolio at no additional cost. Indeed investing redefined. During the last weekend, CZM hijacked my laptop and was using it to work. Out of boredom, I googled for the "best finance books to read in 2017" and came across the link by Business Insider - The 25 best personal finance books to read in 2017. 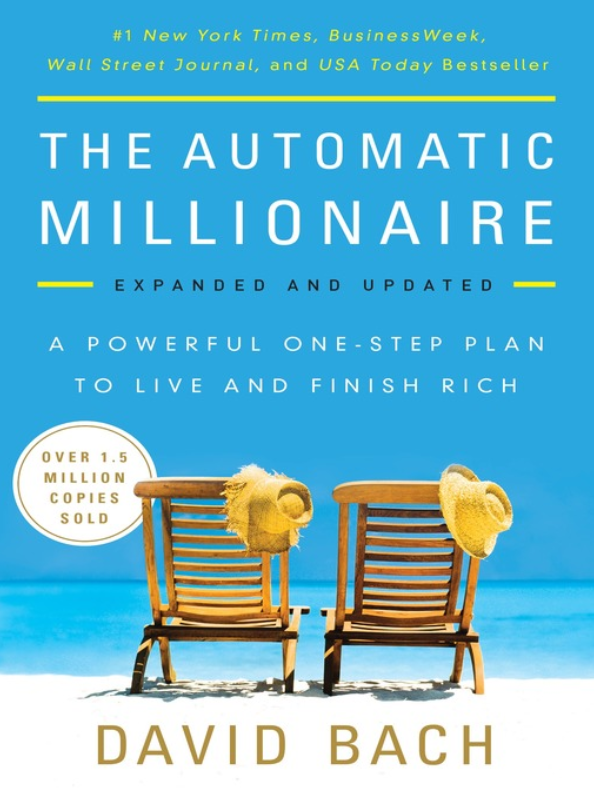 As I read the article, this particular book, The Automatic Millionaire by David Bach caught my eye. As recommended by one of the readers during my last book review (Book Review - Building Wealth through REITS), we can borrow the book from the National Library Board mobile app/site and use OverDrive to read for free! You will need to sign up for a myLibrary ID with NLB first. I enjoyed reading the book as it was interesting, easy to read and teaches important concepts with various examples. There are 9 chapters in total (estimated reading time by Overdrive is 3 hours) and I will briefly share some of the content that resonated with me. Everyone knows this, spending money on a cup of coffee in Starbucks ($5+) vs hawker/food court ($1+). Indulging once in a while is fine but buying it every day, is it really necessary? The latte factor is not limited to just coffee, it can be anything (cigarettes, atas restaurant, etc.)! Assuming if you were to save the money and invest them, you can become a millionaire too! The author recommended tracking your expense for a period of time (a week/month) in order to find your latte factor. We work hard to earn money and every month we will be paying bills, loans, taxes, etc once we receive our salary. 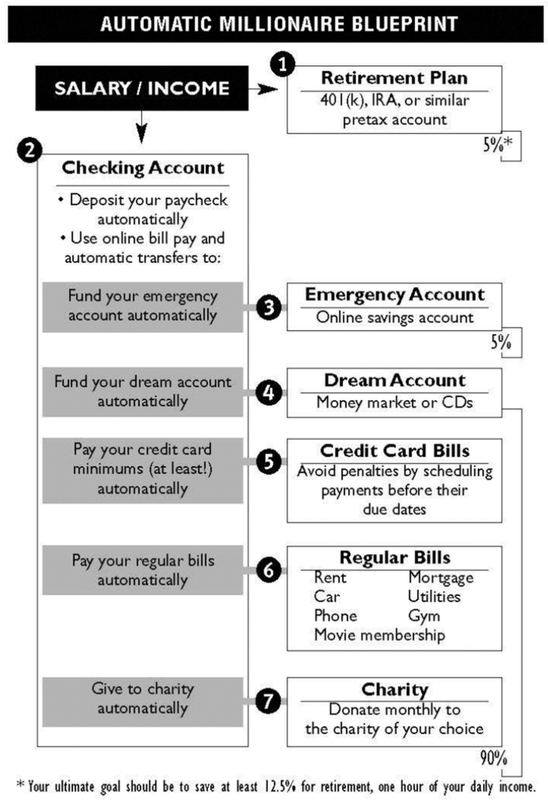 How often does one pay himself/herself first by saving for retirement? The context is based on the 401k and IRA in the United States but the idea is pretty relevant in Singapore too which will be our CPF and SRS. The author recommended one to "pay" himself first by contributing to the retirement account and using pretax money to invest. The idea is simple, every dollar that I earn (take-home pay), that dollar will be taxable by IRAS as income tax. 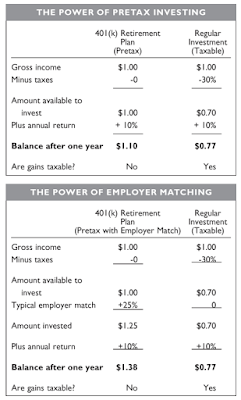 However, if I were to transfer the money into CPF or SRS, that would no longer be taxable and I can then invest more. After saving up, the next thing is to invest your money. 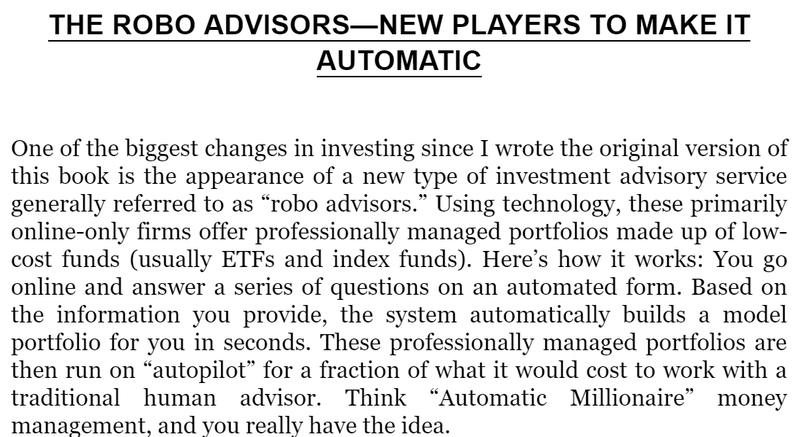 The author recommended investing in mutual funds or ETF as they offer great diversification. 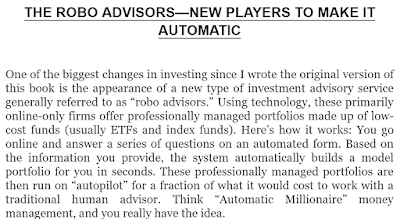 Interestingly, in the latest edition of his book, he included robo advisors as an alternative and recommended the bigger firms such as Betterment and Wealthfront. Unfortunately, we cannot use our CPF or SRS to invest through any of the robo advisors in Singapore. The book also discusses other things such as having sufficient emergency fund, not having any credit card debts, how to get out of debts and donating money to charity. 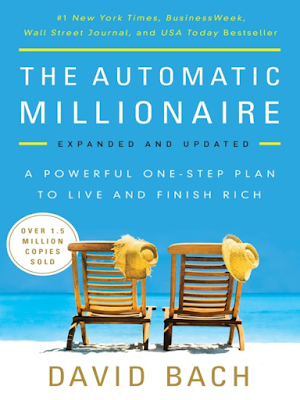 You can refer to the below "Millionaire Blueprint" for a quick overview. I highly recommend one to read this book! 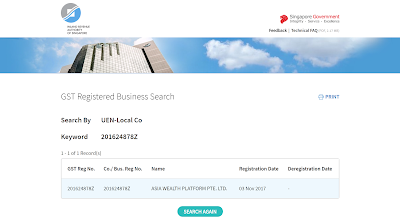 We have purchased 12,000 units of APAC Realty last week (7th December 2017) at $0.86. The IPO price was at $0.66, opened at $0.695 on 28th September 2017 and went as high as $0.975! At the point of writing this article, the price is currently at $0.865. 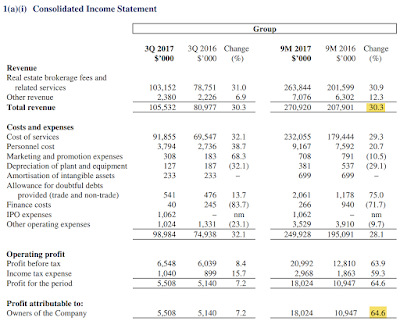 The latest 3rd Quarter financial statement was pretty good where the revenue till date for the year (9 months) improved by 30.3% and the profit by 64.6%! In its IPO prospectus, using the adjusted 2016 EPS of 4.47 cents and IPO price of $0.66, the PE ratio was about 14.76. If we were to use a more conservative approach, we know the PE for 2016 is 4.47 so the EPS for the last quarter is probably 4.47 - 3.52 = 0.95. Assuming that the remaining 2017 (last quarter) would perform as good/bad as 2016, the full year EPS estimate would be around 5.78 + 0.95 = 6.73. At our entry price of $0.86, the PE ratio is at 12.78! What we like about the business is that it is easy to understand - real estate brokerage services (commissions) and other revenue from training fees, franchise fees, etc. The other revenue only contributes about 2-3% as compared to the core real estate brokerage services. Do you foresee Singapore property market recovering/getting better? USD has fallen slightly which is great for those shopping at Amazon during Black Friday and Cyber Monday but not so good for our StashAway portfolio. lol. On a side note, I realized that the statement is different again this month! The exchange rate at the start of the month was 1 USD = 1.3608 SGD as compared to 1 USD = 1.347 SGD at the end of the month. What does this mean? If you are optimistic, it means that you will be able to buy more underlying ETFs units for the same Singapore dollar (assuming the price of the ETF remains constant) going forward. On the other hand, it also means that your current USD investment/portfolio is worth lesser as compared to when you first invested which is why our portfolio would be experiencing a negative currency impact. 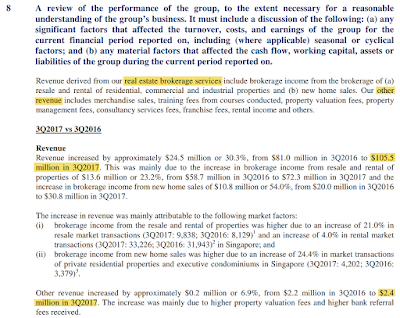 On the bright side, our capital is SGD $2,500 so there is a $36.57 profit even with a -$20.06 currency impact. We receive USD $0.92 dividends which have been paid and reinvested. I still hate the fact that we are not provided the exchange rate when the SGD deposit was converted to USD. 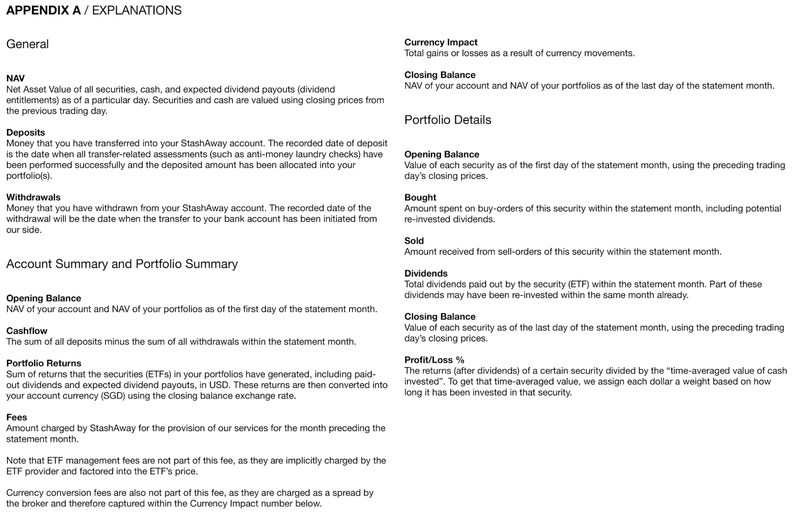 They added an appendix to provide explanations for the various financial terms used in each section of the statement. I thought this was pretty neat and helpful to those new to investing. Saving the best for the last, I shall be revealing the most interesting change! KPO has sharp eyes/attention to details (CZM says self-praise is no praise). Drum roll please! lol. Above is a screenshot of both the October and November statement side by side. What do you see? Yes! There is a GST Registration number! Ever wonder why some shops/eateries do not charge GST while some do? According to IRAS website - GST Registration Liability, this can only mean 2 3 things for StashAway. 3. Alternatively, as some readers have pointed out, it is possible to register for GST voluntarily but why register for it now and not right at the start? A quick search on the IRAS portal revealed that they registered for GST on 3rd November 2017. Whether StashAway has already made $1 million in the last few months or will be making $1 million in the next 12 months, I would view this as a piece of good news similar to those where companies are conducting shares buyback or insiders buying more shares. This is definitely a boost of confidence for those that are worried that the company would close down/go bankrupt. lol. This is purely my opinion. 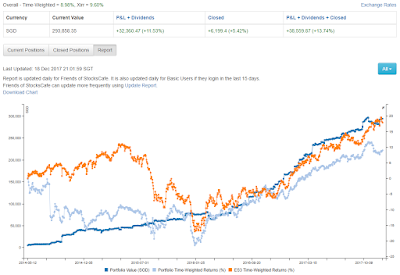 This month commentary: In terms of absolute P&L, StashAway return is ranked number 2 at 1.4%. 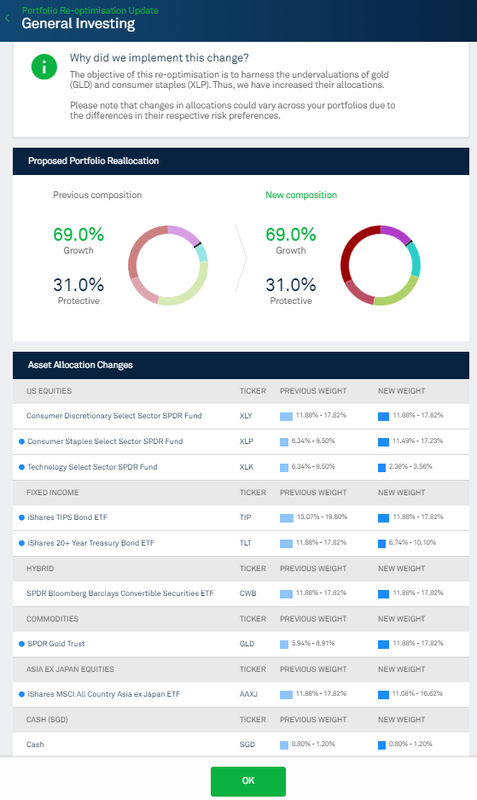 Using SCB Priority Online Trading to invest in SPDF STI ETF has the highest return at 2.19% as compared to using POSB Invest-Saver to invest in NIKKO STI ETF with the lowest return at 1.12%. Although both STI ETFs are tracking Singapore Straits Times Index, the difference in return can be attributed to the effect of fees/commissions due to the usage of different platform to invest. The same can be said when one chooses to invest in ETFs vs unit trusts/funds - fees/costs matters. Apart from the absolute P&L, we should also look at the Reward-to-Risk Ratio where risk/volatility is taken into account. For more information, do read StashAway Clarifications - Reward-to-Risk Ratio. StashAway has the highest ratio of 0.98 which is significantly higher than the other 2 STI ETFs. Let me quote Freddy Lim (Co-Founder & Chief Investment Officer of StashAway), "for every dollar of risk taken, StashAway P28 is producing 0.98 times the return". 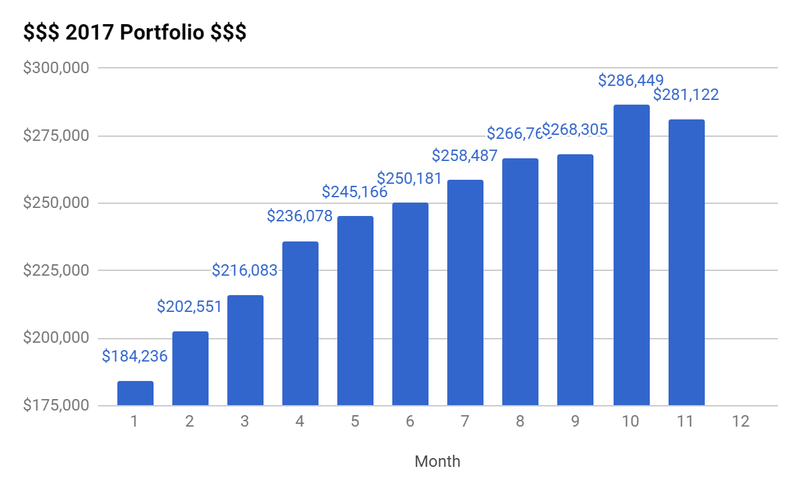 Our portfolio shrank by -1.86% to $281,122 - $3,434.19 of capital injection and -$8,761.19 of capital growth/reduction. We enjoyed a $9,925.66 of capital growth in October 2017 and that has disappeared faster than expected. In short, the decrease is due to the property stocks retracing back to the previous level. I blogged about MindChamps in the previous article - What's Harder than BTO? IPO. Our initial plan was to hold it for the long term but due to a change in government policy, we decided to put a stop loss and the stop loss was eventually triggered. 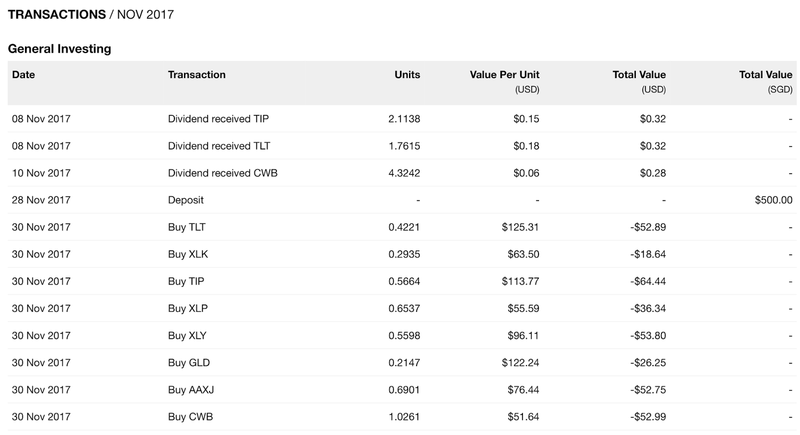 It was still a decent profit for about 5 days - $104.11 (+2.4%) and an annualized return of +454.5%! 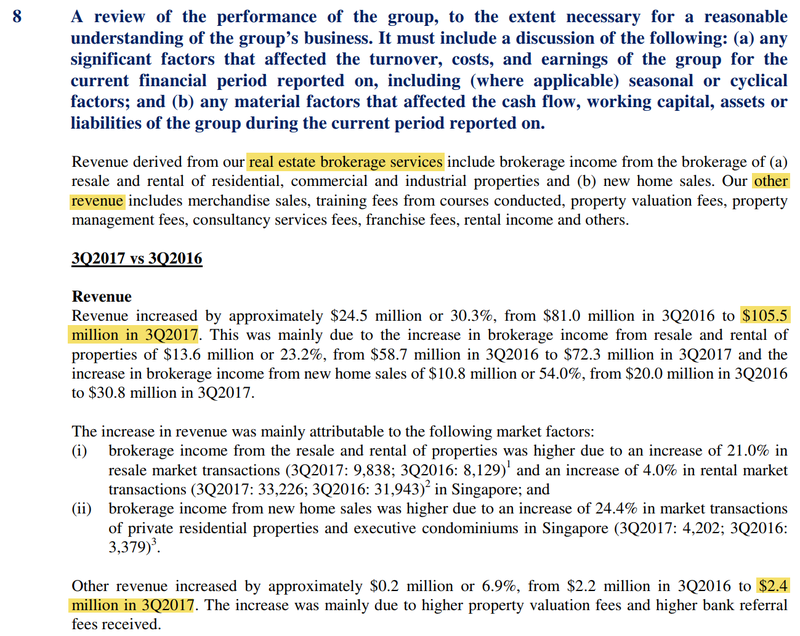 We decided to buy more Capitaland when the majority of the property stock price decreases last month. Capitaland is the largest local developer in terms of market capitalization (GLP will be delisted soon) and it is well positioned for more growth by expanding into other countries instead of bidding aggressively/en bloc for land in Singapore. Do take a look at this article if you missed it - StashAway Clarifications - Reward-to-Risk Ratio where Freddy Lim (Co-Founder & Chief Investment Officer of StashAway) clarify how StashAway is optimising return by taking on lesser risk.